Earlier today we rolled out the second installment of our weekly college football roundtables by continuing our discussion of 2015’s top quarterbacks. This afternoon, we return as TSS Associate Editors Bart Doan and Terry Johnson join Kevin Causey and a rotating special guest in our weekly roundtables discussing all things college football. This morning we discussed which first year starter was poised to have a breakout season. This afternoon we look at returning starters as we are joined by Seth Jungman of Staking the Plains. Question: Which returning starter at QB will show the most improvement this season? This is a bit tricky in the Big 12 because I don’t think Trevone Boykin reached his potential. I think he’s still has room to improve by quite a bit, I’m guessing that TCU wants Boykin to be better in his completion percentage, but the first year in a new system and being a Heisman candidate for the better part of the year is really pretty remarkable. The traditional answers have been Patrick Mahomes at Texas Tech and Mason Rudolph at Oklahoma State. Both haven’t been assured at starting (I think Rudolph has to a point) and Mahomes is competing with Davis Webb. I’ve struggled a bit to figure how Rudolph is a bit of a hotter name than Mahomes, although maybe it is because he has been given the reins (for the most part) and his numbers were good, but not great, 284 yards a game, 6 touchdowns, 4 interceptions and completing 57% of his passes. For a true freshman, those are some terrific numbers, but Mahomes with some part-time and less than terrific outings against Oklahoma State, Kansas State and TCU, really poured it on the latter part of the season. In Mahomes last three games of the year, Oklahoma, Iowa State and Baylor, Mahomes completed 56% of his passes for 440 yards a game, 14 touchdowns and 2 interceptions. The biggest difference between Mahomes and Randolph? Wins. Randolph has two wins in his last three games, Oklahoma and Washington, while Mahomes only has a win against Iowa State. The other issue with Mahomes is that he is competing with Davis Webb and there isn’t a guarantee that he’ll be “the guy” by the end of spring, although most Texas Tech fans feel that he will. And we haven’t really even touched on some of the guys battling for jobs. Skyler Howard was terrific in relief of Clint Trickett. Really good in relief for the most part, but there’s the thought that he might not even keep his job, losing it to Williams Crest. Same thing with Texas, where Tyrone Swoopes is the incumbent, but Jerrod Heard should probably push Swoopes quite a bit. Not only that, but if Texas goes towards a more hurry-up offense, like they have indicated, then maybe this isn’t the right offense for Swoopes. I have no idea how to gauge the quarterback battle in Norman. My gut tells me that Lincoln Riley will be able to make a star out of whoever plays because Riley has always done that. Given the fact that two of the three quarterbacks have played, Trevor Knight and Cody Thomas, that’s not a bad bet to take either one of them. You have to have played to be most improved and it seems that we’re down to the quarterback situation at Oklahoma, Texas Tech and Oklahoma State. Given that I’d have to pick the right one at Oklahoma, I think it’s down to Mahomes and Randolph and I’ll take Mahomes simply because he was a raw athlete that figured things out on the fly and did it against some really good teams and defenses. It’s a home pick, but he’s got a long ways before he reaches his potential. I sat down and had a beer before this question, mostly because I like beer but partially because I didn’t know the answer. After semi-serious thought, it was like sifting through the menu of a restaurant and realizing that all the meals you were thinking about weren’t the answer. This one was (honestly, it’s usually some form of red meat). Christian Hackenberg, Penn State. 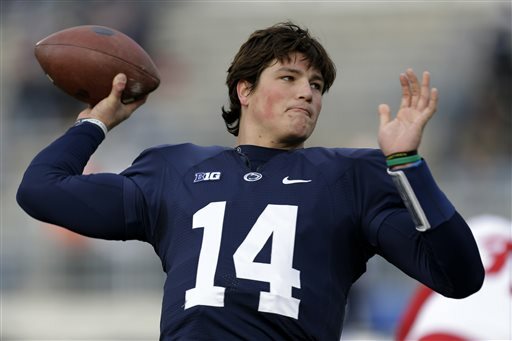 Hackenberg has entered into the either enviable or unenviable role of, “who really cares what he does … we decided like 3 games into his freshman year he was an NFL prospect” realm. For him, it’s good, since money is the bottom line. But he’s become the guy that no matter what he does, people just go to the NFL prospect thing because he looks and throws like Tom Brady/Peyton Manning/Joe Flacco/insert semi-mobile strong armed pocket passer here because they want to look revisionist history-smart. All that said, Hackenberg should improve in spades because if nothing else, the leap you make in anything from the beginning to the second round of it is the most immense, and he’s now had another year to work on the James Franklin PSU system. He should come out of it well. Not that Hackenberg was terrible last year. His offensive line didn’t really help as much as it could have and that wears on you over a season. But further understanding of the offense will lead to more confident quick throws when a pocket breaks down, and regardless, this is his year to make that NFL leap since he’s eligible and all. If that kind of money isn’t a motivator, nothing is. When I reviewed the quarterback situations in the Pac-12 (insert gratuitous link here), the one guy that really jumped off the page as having the biggest opportunity to improve was Anu Solomon. As a red-shirt freshman, Solomon took the conference by storm as the Wildcats raced out to a 5-0 record including a win over Oregon. After a great start, Solomon hit a wall and had four straight games where he completed less than 56% of his passes including three games where he failed to complete half of his passes. Despite that slump, the Wildcats finished the regular season 10-2 and on a four game win streak. What will make Anu stronger is the end of the season where the Wildcats got trounced by Oregon in the Pac-12 Championship Game and then fell to Boise State in the Fiesta Bowl. While it was a fantastic feat for a red-shirt freshman to lead Arizona to a birth in the Fiesta Bowl, that sting of the end of the season will lead Solomon to become a better player this off-season and into the 2015 season. Health was a big factor in Anu’s slump down the stretch in 2014 so he’s working this off-season to get stronger and in better shape. With a full year of experience behind him and a full off-season ahead of him, look for Anu to come out guns blazing in 2015. The returning starter I expect to see the most improvement from this fall is Oklahoma’s Trevor Knight. Make no mistake about it: when he’s on top of his game, Knight is one of the top quarterbacks in the country. He turned in a monster performance against Alabama in the 2014 Sugar Bowl, throwing for 348 yards and 4 Tds against a Nick Saban-coached defense that had plenty of time to prepare for the content (not an easy task!). He also displayed flashes brilliance last fall, posting 300-yard efforts against Tennessee, Baylor, and Kansas State. Unfortunately, he’s also had trouble with consistency at times as well. While he threw for over 300 yards against Baylor, Knight only completed 40% of his passes that day. More alarmingly, Knight has thrown an interception in 12 of the 18 games in which he’s played. That will change this fall with new offensive Lincoln Riley’s arrival in Norman this fall. Although he’s best known for the high octane, “Air Raid” offenses that he led at East Carolina, it’s worth noting that Riley is one of the top quarterback coaches in the country. In his 5 seasons in Greenville, Pirate QB’s completed 66% of their passes while throwing for an average of 4,043 yards per season. There’s no way to compile numbers like that over a 5-year span without excellent coaching. With Riley coaching him up, I expect to see Knight emerge as one of the most consistent quarterbacks in the league this year, vaulting the Sooners into both the Big 12 and College Football Playoff races this fall.